Like matches, knives are one of those quintessential things adults tell kids never to play with. I mean, everyone knows you can’t handle knives till you’re big enough to know the rules…right? So for your sakes as much as my own, I did some cutting-edge research into the must-know rules for properly using — and caring for — one of the most important tools in the kitchen. If you’re not a culinary school grad, you might be utterly overwhelmed when shopping for knives. The selection can get pretty wild. In fact, I’ve come across some absurdly specific knife options such as the grapefruit knife, the tomato knife, or the sashimi knife. But unless you’re a grapefruit groupie or a makizushi maven, you don’t need to worry about these specialty knives. 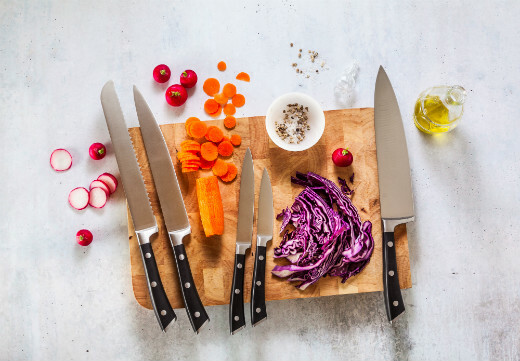 In fact, if you invest in the following three essential kitchen knives — and know when to whip them out — you’ll be pretty much set for all your slicing and dicing needs. Quite the impressive utensil, this broad knife is a home chef’s go-to tool for as much as 90% of kitchen duties. Smartie tip: Though chef’s knives can come in blade sizes up to 14 inches, experts say home cooks should stick with an 8-inch blade. 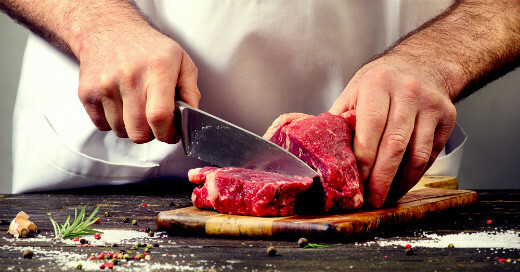 Use a chef’s knife for: chopping firm items like onions, root vegetables, and meats. This petite kitchen knife — the average blade is three to four inches long — is perfect for chopping and mincing items that are too small for the bulky blade of a chef’s knife. Use a paring knife for: mincing garlic, peeling fruits and vegetables, slicing soft items like bananas or avocados. 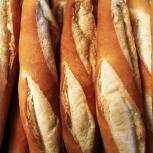 Also known as a “bread knife”, a serrated knife has a jagged, tooth-like blade that cuts cleanly through delicate breads, pastries, and produce. Use a serrated knife for: Slicing through tender items like bread, tomatoes, citrus, and baked goods, and for cutting through foods with waxy surfaces like watermelon and peppers. For kitchen safety, keep your knives at tip-top sharpness. A dull blade will require you to apply brute force to your food, highly increasing your chances of cutting yourself. In contrast, a sharp knife will give you the most predictability and control. A simple test: If your knife cannot slice swiftly through an onion, it’s time for a sharpening. You can purchase an inexpensive electric or manual knife sharpener online. Or, if you’re in a pinch, sharpen your knife with a ceramic mug. abrade a knife’s sharp edge and shorten its lifespan. Instead, always hand-wash your knives in the sink. Where do you keep your kitchen knives? Tossing a knife straight into a drawer can quickly dull its blade. Also, it increases the likelihood of accidents. Consider investing in any of these smarter ways to store knives: a magnetic knife strip, an in-drawer knife dock, a wooden knife block, a knife bag, or individual blade guards. The fastest way to ruin a knife is to use its blade to scrape off leftover food from your cutting board, hack open an aluminum can, or slice through that utterly despicable packing tape that stands between you and your Amazon delivery (so been there, so done that). Though it can be ultra-tempting to reach for your knives when you need something sharp, to keep your knives in top shape, save them exclusively for food prep.